LABOUR BULLETIN : Message to TAN SRI SYED MOKHTAR AL BUKHARY - Press Release ::: Press Report for DRB Group – Termination action against workers exercising their political rights is abhorred. 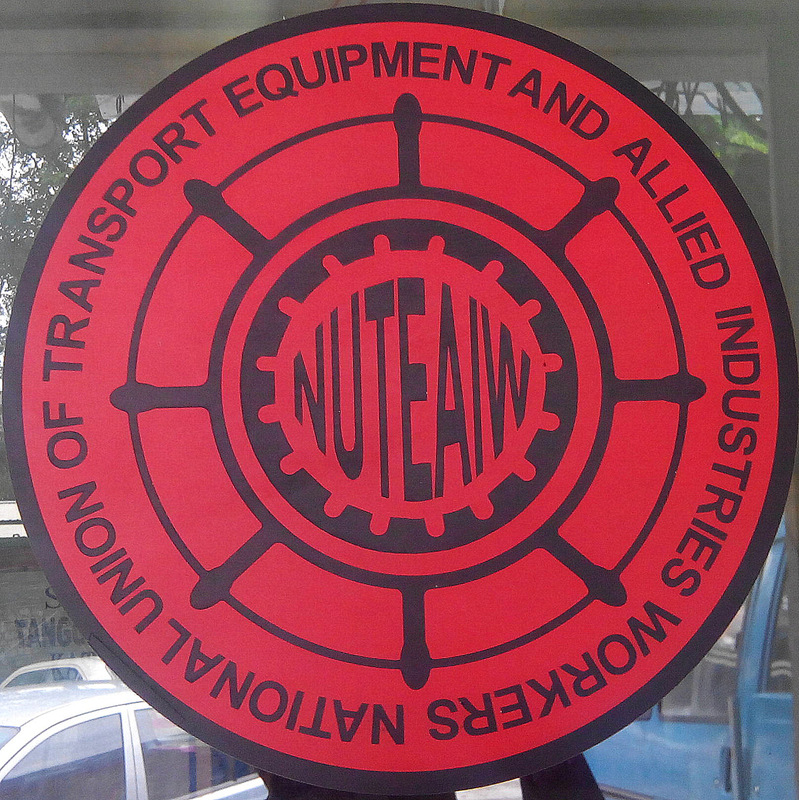 We, the National Union of Transport Equipments & Allied Indutries Workers NUTEAIW) is appalled by the action of DRB Hicom companies, being Hicom Automotive Manufacturing Sdn Bhd and Isuzu Hicom Sdn Bhd in Pekan, taking disciplinary action against 18 workers who exercised their right as citizens outside working hours. Pursuant to a decision by the Malaysian Trade Union Congress (MTUC), which was also supported by the NUTEAIW, to extract commitments on worker rights from contesting candidates and political parties, workers went to meet contesting candidates before election day. On 3/5/2013, these 18 workers submitted the MTUC memorandum to one of the contesting candidates in the Parliamentary constituency, which also happens to be the constituency that the Prime Minister of Malaysia was contesting. For this, disciplinary action have been initiated by two DRB HICOM companies in Pekan, after more than 85 days of suspension were terminated on 19th August 2013.
and Volkswagen , issued show cause letters to 16 workers, and speedily proceeded with the Domestic Inquiry on 11th June 2013 and terminated them on 19th Auguste 2013. Likewise, Isuzu Hicom Sdn Bhd, that assembles automobiles for Isuzu, issued show cause letters to 2 workers and they too has been terminated by the Company on 19th August 2013. 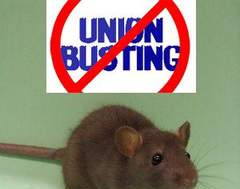 The workers were not allowed the right to be represented by representatives of the National Union, only representatives from the work site committee. We consider this not only a gross violation of worker rights, but a violation of the right of citizens to participate in the democratic process of Malaysia during the 13th General Elections. No employer should have the right to dictate directly or indirectly the political choices, activities and/or actions of their workers, more so outside employment hours. Workers, as citizens, of Malaysia must have the freedom to join and participate in any political parties, even offer themselves as candidates and involve themselves in campaigning in general elections. Hence the taking of this disciplinary action against workers for things they did in exercise of their rights as citizens in a democracy during the 13th General Elections is an infringement of their rights. The best thing that these DRB Hicom companies can do now is to immediately reinstate these workers without any delay. The charges levied against the workers are (1) Undermining the image or good name of the company orally, in writing or by action, and (2) Bringing about or trying to bring about any form of influence or outside pressure to submit or support any external claim that is related to service be it an individual claim or claims of other employees. The employer allegedly is of the position that the participation and action of the said 18 workers, were contrary to the interest of the company gave the false impression that the company was involved in politics. If the company fears that there will be a perception that ‘the company was involved in politics’, it is hypocritical given the fact that during campaigning period, on 25/4/2013, the company encouraged workers to go and meet the Barisan Nasional Paliamentary candidate for Pekan, Mohd Najib Abdul Razak, also the incumbent Prime Minister. Workers were allowed to go for the meeting during working hours. This event was also highlighted in Najib’s 13th General Election Pekan Constituency candidate website (http://www.parlimenpekan.com,) and the posting was entitled ‘Dato’ Sri Najib Beramah Mesra Dengan Warga DRB-Hicom Pekan’ (Dato’ Sri Najib Socialize with DRB-Hicom citizenry). Later that very day women workers were also allowed by the company to meet up with Najib’s wife. Companies and businesses should never terminate a worker for reasons other than matters that relates to work performance and/or their conduct as a worker save for very exceptional cases like where a worker is convicted for a criminal offence. action by these DRB Hicom companies. We call on DRB Hicom, Hicom Automotive Manufacturing Sdn Bhd and Isuzu Hicom Sdn Bhd to immediately reinstate them without loss of benefits. We call on Prime Minister Mohd Najib Abdul Razak, being also the Member of Parliament for Pekan, to intervene and ensure that worker and citizen rights of his constituents are not violated by employers. (YORK, UK) - We, the undersigned 41 civil society organizations, trade unions and concerned groups, are appalled by the actions of two DRB Hicom companies based in Pekan, namely HICOM Automotive Manufacturers (Malaysia) Sdn Bhd and ISUZU HICOM Malaysia Sdn Bhd for taking disciplinary action against 18 workers who merely exercised their rights (outside working hours), as citizens, to participate in the democratic process. Pursuant to a decision by the Malaysian Trade Union Congress (MTUC), which was also supported by the National Union of Transport Equipment and Allied Industries Workers (NUTEAIW), to extract commitments on workers' rights from contesting candidates and political parties involved in GE13, workers throughout Malaysia, including in Pekan, met or attempted to meet contesting candidates from all parties before election day, being on 5/5/2013. Accordingly, on 3/5/2013, a group of 18 workers submitted the MTUC memorandum to one of the contesting candidates in the Pekan parliamentary constituency, which also happens to be the constituency that the Prime Minister of Malaysia was contesting. First, HICOM Automotive Manufacturers (Malaysia) Sdn Bhd, which assembles automobiles for Suzuki, Mercedes-Benz and Volkswagen, has issued show cause letters on 22/5/2013 to 16 workers, and speedily proceeded with the 'Domestic Inquiry' which began on 11/6/2013. At present the Domestic Inquiry is yet to end and there is no decision. Second, ISUZU HICOM Malaysia Sdn Bhd, that assembles automobiles for Isuzu, also issued show cause letters to 2 workers. They, too, are awaiting the decision of the Domestic Inquiry. Significantly, the workers were NOT allowed the right to be represented by lawyers or representatives of the National Union, only by representatives from the work site committee. We consider the action taken by the two DRB Hicom companies not only a gross violation of worker rights. It is also a violation of the right of citizens to participate in the democratic process of Malaysia, especially during elections. No employer should have the right to dictate directly or indirectly the political choices, activities and/or actions of their workers, more so outside employment hours. Workers, as citizens, of Malaysia must have the freedom to join and participate in any political party of their choice, offer themselves as candidates if they so wish, and involve themselves in campaigning in general elections. Hence DRB Hicom's taking disciplinary action against these 18 workers for exercising their rights as citizens in the run-up to GE13, is completely uncalled for. It is a gross violation of the rights of these 18 workers. Under the circumstances, we demand that DRB Hicom stop all disciplinary actions being taken against these 18 workers immediately. If any of these 18 workers have already been terminated, they should be reinstated immediately. We understand that the charges leveled against the workers are (1) undermining the image or good name of the company orally, in writing or by action, and (2) bringing about or trying to bring about any form of influence or outside pressure to submit or support any external claim that is related to service be it an individual claim or claims of other employees. We further understand that the employer DRB Hicom is trying to rationalise its action against the said 18 workers - in seeking a commitment on workers rights from the Pekan parliamentary candidate – by claiming that the workers might have given the 'false impression' that 'the company was involved in politics' which is contrary to the company's stance. We find such an explanation laughable! Indeed, it is hypocritical given the fact that during the electoral campaign period, on 25/4/2013, the company had encouraged workers to go and meet the Barisan Nasional Paliamentary candidate for Pekan, Mohd Najib Abdul Razak, also the incumbent Prime Minister. Indeed, workers were allowed to go for the meeting during working hours! 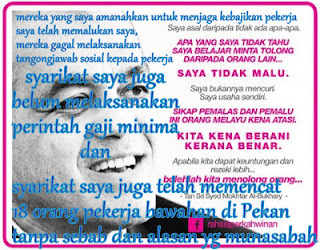 This event was also highlighted in Najib’s 13th General Election Pekan Constituency candidate website (http://www.parlimenpekan.com/?p=840), and the posting was entitled ‘Dato’ Sri Najib Beramah Mesra Dengan Warga DRB-Hicom Pekan’(Dato’ Sri Najib Socialize with DRB-Hicom citizenry). Later that very day women workers were also allowed by the company to meet up with Najib’s wife. Companies and businesses should never terminate a worker for reasons other than matters that relate to work performance and/or their conduct as a worker save in very exceptional cases, for eg, like when a worker is convicted of a criminal offence. These 18 workers have families and children, and a termination would cause great hardship to their well-being and livelihood. Amongst the 18 are also trade union leaders, including also the current chairperson of MTUC Pahang Division. We hope that the termination of worker leaders does not occur and that the two DRB HICOM companies are not resorting to ‘union busting’. We call on DRB Hicom, HICOM Automotive Manufacturers (Malaysia) Sdn Bhd and ISUZU HICOM Malaysia Sdn Bhd to immediately discontinue disciplinary action against the said 18 workers, and if any be already terminated to immediately reinstate them without loss of benefits. We call on Prime Minister Mohd Najib Abdul Razak, being also the Member of Parliament for Pekan, to intervene and ensure that the rights of his constituents, as workers and as citizens, are not violated by employers. Note:- The statement was send to the Prime Minister of Malaysia but still no response yet. We call on you, Prime Minister Mohd Najib Abdul Razak, being also the Member of Parliament for Pekan, to intervene and ensure that the rights of his constituents, as workers and as citizens, are not violated by employers. Intervene to ensure that the disciplinary action against the said 18 workers is discontinued, and ensure that they not be terminated for exercising the rights as citizens in a democracy. Kindly acknowledge receipt, and we would appreciate being kept informed of steps taken in response to this statement. Sebesar manakah empayar Syed Mokhtar Albukhary? Ketika penutupan pada Jumaat, MMC Corp yang dikuasai Syed Mokhtar Albukhary mempunyai modal pasaran kira-kira RM8.22 bilion. Ini menunjukkan bahawa pemilikan kepentingan 51.76 peratus Syed Mokhtar mempunyai nilai pasaran sebanyak RM4.25 bilion. Syarikat utamanya DRB Hicom pula ditutup pada RM2.56, menjadikan modal pasarannya sebanyak RM4.95 bilion. Ini menjadikan pegangan 55.92 peratus mempunyai nilai pasaran sebanyak RM2.77 bilion. Oleh itu, kepentingan kolektifnya dalam kedua-dua syarikat itu bernilai lebih RM7 bilion. Awal tahun ini, Forbes menyenaraikan Syed Mokhtar sebagai rakyat Malaysia ketujuh terkaya dengan nilai bersih AS$3.3 bilion atau kira-kira RM10.5 bilion. Namun, untuk sampai ke tahap itu bukanlah perkara mudah. Aset beliau sebenarnya dipelbagaikan dan pegangannya dipecah-pecahkan. "Banyak aset dikaitkan dengannya, tanah-tanah di Johor, sekarang orang bercakap bahawa beliau sebahagian daripada Eco World Development (Sdn Bhd)... jadi banyak aset dikaitkan dengannya. 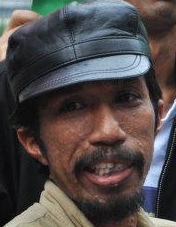 "Mungkin hanya beliau sahaja yang tahu nilai aset sebenarnya," kata sumber yang mengetahui perihal taikun perniagaan itu.